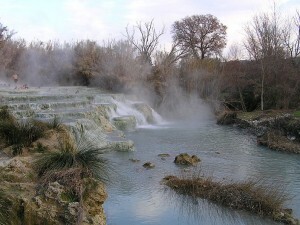 Saturnia is situated on a hill dominating the famous spa in the territory of Manciano. These sulphureous hot water springs at a temperature of 37.5 degrees are renowned for their therapeutic properties. The village was born in Roman times along the via Clodia near the Etruscan necropolis of Pian di Palma and near the hot water springs already famous in those days. The village was unfortunately destroyed in the 6th century and therefore started to decline. In 1274 it was then included in the county of Sovana, dominated by the Aldobrandeschi family. In the 14th century it went first under the dominion of the Baschi family and then under the Orsini. In the following century it was controlled by the Sienese until the middle of the 16th century when it became part of the Grand Duchy of Tuscany.